All the normal principles of netiquette apply on this board. Please keep your messages on topic. Behavior and language that would be unwelcome within the borders of Fantasyland is quite unwelcome here as well. Advertising or other attempts to use these boards for financial gain are not permitted. Libel and slander will not be tolerated. Consistent attacks and singling out every person with a differing opinion will also not be tolerated. Personal attacks and attacks on providers of goods or services are also prohibited. These rules are explained in further detail later in this FAQ. PassPorter Guides are the members of our community who facilitate and encourage others members of the community to contribute. Guides often answer questions, create new topics, and post announcements. If there is a problem or concern in a particular forum, the Guide is the person to ask about it. Guides are volunteers, not employees nor staff of PassPorter Travel Press. So be extra nice to them -- they are the cornerstone of our community! Part of a Guide's responsibilities are to ensure that our guidelines are followed -- this may require that a thread is edited, deleted, closed or moved, among other things. If these decisions impact you, we ask that you respect them. Should you have any questions about a Guide action, please send them directly to support@passporter.com. We ask that you refrain from discussing Guide decisions on the message boards, as could result in an action from the administrator. Please refrain from making religion or politics a topic of conversation on our message boards, except in those cases where it directly involves your travels (i.e, finding religious services, visiting holy sites, discussion or attractions and events of a political or religious nature such as the Hall of Presidents, the Candlelight Processional, Christmas season, attending political conventions, travel to places with political unrest, etc.). PassPorter welcomes everyone, but when religion and politics are discussed, the end result is that some people do not feel welcome and may be afraid to participate. We also ask that you do not make prayer requests, as this excludes those who do not pray from participating -- instead, you can ask for thoughts, "pixie dust" or good wishes, which anyone can offer. Typical expressions of religious or political belief and affiliation are welcome. You are welcome to say things such as, "I will pray for you," "I'm a Republican (Democrat, Christian, Buddhist, etc. )," "Christmas is my favorite time of year, and I love going to Midnight Mass," etc. If you need to discuss religious or political topics more directly, we recommend you visit http://www.allspiritual.com or these political forums. Please respect the copyrights of others. You may not repost messages from e-mail, other message boards, Usenet newsgroups, web sites, books, newspapers, magazines or other sources without permission of the author/copyright holder of that material, except for brief quotations as provided for by the fair use principles of U.S. copyright law. Posts and/or message threads that violate these standards will be removed or edited without apology. Within the boundaries stated above you may feel free to discuss any appropriate topic, even if it happens to be a glowing review of a travel guide published by another company (so long, of course, as it's an independent consumer evaluation). In fact, we encourage this sort of discussion and comparison as it is helpful to vacationers. Although most users of these boards are not trained journalists we encourage you to think like journalists when reporting to the members of this community. We encourage you to prepare messages that are complete and balanced in presentation. Please cite the source of information whenever possible, and distinguish between personal eyewitness accounts, hearsay, rumor, speculation, official statements, and third-party reports. When possible offer URLs (web addresses) to important source materials. State whether costs, dates, times and similar information is exact or approximate, and note whether prices include or do not include sales tax. Please also attempt to stay on topic within a particular forum -- use the forum descriptions as a guide for what are and are not appropriate topics. If we see topics we feel would be best in another forum, we will move the topic. Before you ask a question of the members of this group, recognize that obtaining the answer to your question may require them to place one or more long-distance telephone calls. If you can easily obtain the answer to your question by placing a telephone call yourself, we encourage you to do so, and if you unearth new information you're encouraged to share it with the rest of the community. Please see our article on Getting Answers to Disney Questions for our top ten ways to find answers to your most burning questions. The original contents of a post remains the property of the author of that post, and the contents of these boards constitute a compilation under U.S. copyright law. Any copy or reproduction of all or part of the contents of this message board without the expressed permission of the individual authors and MediaMarx, Inc. is prohibited. Those wishing to create a hyperlink to this message board and/or other parts of this site from their own web site are encouraged to do so, and asked to send information about the link to webmaster@passporter.com as a courtesy to the operators of this site. It's best to browse our message board for a while before you post your first message. Read a few subjects (threads) the first time you visit our board, and then read new messages for another couple of days. You'll see what topics are hot and which are cold, you'll get to know some of the key participants, and you'll become familiar with the demeanor of our board. Write clearly when you compose a message. Review your message carefully before submitting it; typos are confusing. Remember, if your message can be misunderstood, it will be. "Me too" messages are a quick way to irritate other members. If you agree with a posting, either enjoy your consent by yourself or reply with an informative comment about why you agree. Imagine how dull a board would get if it contained hundreds of "me too's." Do not post the same message in multiple threads and/or forums. If you feel your message needs to be seen in multiple threads, please put post a link to the thread with your message rather than duplicating the message. If we find duplicate posts, we may delete the copies without notification. Be careful about including private information about yourself, family members, and family/friends in the military, such as phone numbers, street addresses, and military deployment information. Private information of that nature may be better sent by e-mail. Additionally, be careful posting hearsay or unverified rumors that aren't identified as such. Don't issue personal attacks, use profanity, or post threatening, abusive, harassing, or otherwise offensive language or images. You also may not impersonate another individual or communicate under a name that you are not entitled to use. Please treat every individual on the boards in the way you would expect to be treated in return and please respect other people’s views in every discussion. Discuss issues, not one another, unless you have something positive or neutral to say. We expect individuals to avoid singling out and attacking each person who has a differing opinion to their own. Some replies are better sent as e-mail, rather than posted to our message board. Personal messages and especially critical comments are more appropriate when sent directly and privately. You can click the author's name to compose an e-mail to them. Chain letters are never appreciated in the online community. Advertisements are just as unwelcome. Please our message board guidelines in their entirety. Use your own words. If you want to quote another source, be brief (a few sentences will do) and provide a hyperlink to the remainder of the information. Advertising or other attempts to use these boards for financial gain are not permitted. Any posts that are deemed as advertising for a commercial interest will be deleted. This includes "for sale" announcements. Commercial advertising is considered to be any individual posting for the purpose of promoting a for profit organization not directly affiliated with PassPorter Travel Press/MediaMarx, Inc. Members are free to share their experiences with various companies, but anything considered advertising will be deleted and the member may lose posting privileges. It is acceptable to include the name of your business/product and a basic link to your web site in your signature and in your profile. A basic link to your eBay profile or eBay store page is also acceptable, but link(s) to specific auction items on eBay are not acceptable. Please do not include additional information or logo graphics related to your business or product in your posts, signature, or profile. If you are interested in entering into an advertising relationship and/or forum sponsorship with PassPorter.com, please visit our Advertising page. PassPorter members tend to be very loyal and supportive, particularly of their favorite travel agent, transportation company, and so on. We find, however, that it works best if everyone leaves their favoritism behind and simply focuses on helping people who ask questions on the message boards. We require that all travel agents, transportation companies, and other travel-related companies who participate on our message board be cooperative and purely non-commercial, and we'd like their fans to represent them in the same, “professional” manner. Please understand that it's really not necessary to make sure your favorite agency's or company's name is mentioned every time someone else happens to mention the "competition." Everything averages out in the end. If you do have something to say about an agency or company (for good or bad), please limit it to first-hand experience. Do not speculate about whether an agency or company may or may not provide good service, or to imply that one agency or company is more likely than another to provide superior service. There's no point to repeating someone else's complaints or compliments -- please no "me too!" or "I agree!" Just stick to your own experiences. Lengthy discussions of what agency or company is best will be closed and/or removed. The PassPorter message board community exists for the benefit of PassPorter Travel Press and its community. From the beginning we've always sought to curb commercial activity in order to provide a welcoming and comforting environment to our members. We also recognize that the expertise of professional travel agents can be an asset to the PassPorter membership. We allow and encourage agents representing many agencies to participate openly in this community, so long as they can abide by the posted community guidelines. We believe the agents' business is enhanced by their helpful, non-commercial behavior, which allows them to exhibit their expertise, and to interact socially with a community of potential clients. Our members benefit from the quality of help and information provided, and many friendships have been born. We have long enjoyed a situation where agents from many different agencies participate in a low-key, non-aggressive, and collegial manner, to the benefit of our membership and the participating agents and agencies. Due to the overly aggressive activities of some travel agents, we've had to revisit and clarify our guidelines in order to return our community to the kind of atmosphere we desire. A travel agent's job may be to sell travel, but our job at PassPorter is to create a comfortable place where our members can discuss their travels without feeling aggressively solicited or like they are in the cross-fire of travel agent wars. This message board community is owned and operated by PassPorter Travel Press, which is a business. Any business is free to operate an online community and web site for its benefit. However, there is no obligation on the part of a private business to operate its community for the benefit of any other business -- that is solely at the discretion of those who operate the community. This community is PassPorter's "home," and we expect you to behave as a good guest in our home. Guests do not badmouth or undermine their hosts in their hosts' homes, and have the courtesy to refrain from doing so elsewhere. Guests do not challenge the authority of their hosts to maintain order within their homes. All new agents in our community, whether existing or new members, must agree to these guidelines prior to participating in a professional capacity. A member who conceals his/her travel agent status, yet pursues travel business and/or related activities in the PassPorter community, will be considered to be in violation of our our guidelines, and will lose his/her membership in the community. 1. Travel Agent Identification Your message board signature must include the unlinked name of your travel agency and optionally one link to your web site in standardized, plain text at a size of 2 or smaller (no .com names if you choose to give only your agency name). Do not include additional information, slogans, or logo graphics related to your business in your signature. If you fail to divulge your business affiliation, and make posts that we consider to be promotional, your access will be restricted or removed in the same way we address any violation of our advertising and solicitation rules. If you decide not to participate in our community as a travel agent, but rather as a member, you must not post on PassPorter about your travel agent identity or participate in discussions in which travel agents are the subject. Please remember our advertising and solicitation guidelines apply to all members. Your message board profile and home page, and any other public manifestation of your identity that appears in this community, must be consistent with these guidelines. 2. Reciprocation If you place your travel agency link and/or e-mail address in your signature, but do not have an advertising relationship with PassPorter, you must reciprocate by placing a PassPorter.com link and/or graphic on the page that your signature links to. If we cannot find the PassPorter link and/or graphic on your linking page, we will remove your travel agent name and link from your signature at our discretion. If you have questions or concerns about implementing this requirement, contact message board Administrators Jennifer Marx and Dave Marx. 3. Rules and Guidelines Travel agents must abide by all other PassPorter rules and guidelines, wherever posted, with particular attention paid to guidelines governing Advertising, Netiquette, and Service and Business Discussions. 4. Promotional Activities Self-promotional activities, or promotional activities that benefit your travel agency, such as sending unsolicited private messages, sending unsolicited e-mail through the message board system, posting welcome messages on a members' profile, and any other use of the PassPorter message board facilities in a similar manner is strictly prohibited. 5. Professional Manner As professionals, we know that you will behave in a cooperative, purely non-commercial manner on our message boards. In that spirit, do not try to "one-up" another travel agent who has already replied to a member or posted a news announcement or other information. 6. Replying to Posts When you have new information to share, you may reply to member questions in our forums. If you do not have new information to share, refrain from replying. Do not post short messages such as, "Congratulations," "Yeah, that," "Me too," "Good Luck," etc. As your signature and profile contain your agency information, this will be considered a promotional activity. 7. 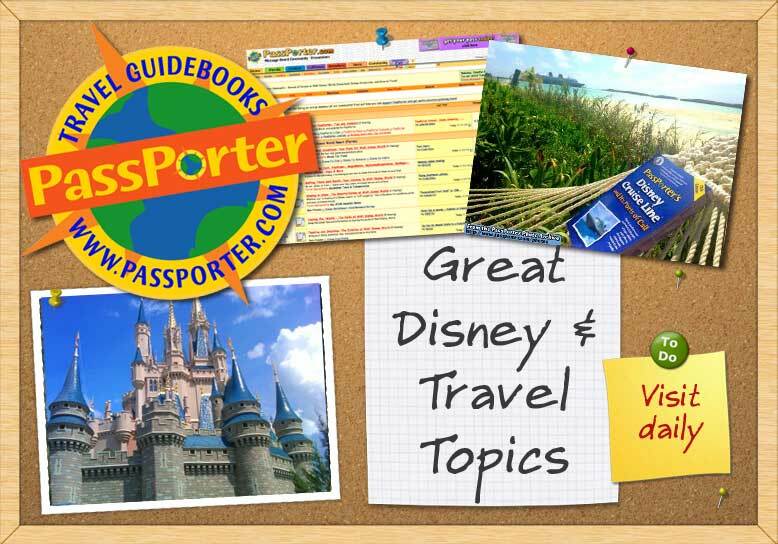 Starting New Topics You are welcome to start new topics if you have information to share such as news from Walt Disney Parks and Resorts, or the release of new discounts that are available to the public and can be obtained without the use of a travel agent. Do not, however, post about exclusive deals and rates only available through your agency and/or other agencies. That information should be communicated privately, to parties who have expressed a prior interest. 8. No Travel Agent Discussion Do not post replies to questions or comments to posts in which travel agents are the subject, such as the benefits of using travel agencies, the qualities (or lack thereof) of other travel agencies or agents, or any other travel agent-related topic in which a travel agent response could be construed as advertising or promotion. We prefer that our non-travel agent members discuss these topics amongst themselves. Additionally, do not monitor or "police" other travel agents and their ability to abide or not abide by these rules -- it is our job to monitor and enforce our guidelines. 9. Non-Client Communication Do not ask non-clients to contact you privately (i.e., via e-mail, private message, or phone) in public posts, unless they have publicly asked about establishing a client relationship with you. Potential clients must choose to contact you, with no encouragement on your part. You cannot withhold information from the public in order to encourage them to contact you privately, or direct them to your agency web site for further details. 10. Client Communication If a current client posts to discuss their existing or potential booking, or any other topic related to your client-agent relationship, reply to the client privately in a manner that works for you (e-mail, phone call, etc,). Post a public reply indicating that you are contacting the member privately, so we (and they) know that they are getting a response. 11. Client Relationships Do not reveal your client relationships to the public. This includes publicly thanking a client for using or endorsing your services, or revealing that you are the agent who had been thanked anonymously. These communications should be private. 12. Groups and Events Travel agents may not discuss their agent/agency-sponsored groups and events in our community without permission from the PassPorter administrators. Such discussions should take place in private or in the agent's own community. If a member asks a question about such an event in our community, you may post a reply indicating that you contacted the member privately, so we know that they are getting a response. 13. Recommendations Do not ask or encourage your clients to post about your travel agency or services, or any other travel agent or service, in the PassPorter community, or reward them for doing so. We consider this a form of advertising. If a client makes unsolicited posts about your travel agency or services, we still reserve the right to close, move, or remove the post(s) and any replies at our discretion. 14. Actions for Non-Compliance If you cannot follow the above guidelines, or we feel you are skirting our guidelines, your access to this community may be restricted or removed at PassPorter's sole discretion. PassPorter's interpretation of these guidelines is final, and attempts to stretch the meaning or interpretation of these rules to your benefit is not appropriate. For all intents and purposes, loopholes do not exist. We reserve the right to modify, move, or delete any travel agent-related post at our discretion and without recourse. If you disagree with our guidelines or philosophy, we encourage you to create your own community at your own site with your own set of guidelines. We encourage you to post links to other web sites on our message boards, provided the sites to which those forums point are appropriate for a family audience. You are also welcome to post a link to your own web site, provided it is not offering a commercial service or for-profit venture and you can provide a link back to PassPorter on your site in an area easilly found. If you are a business owner with a web site, please see our FAQ for business owners.